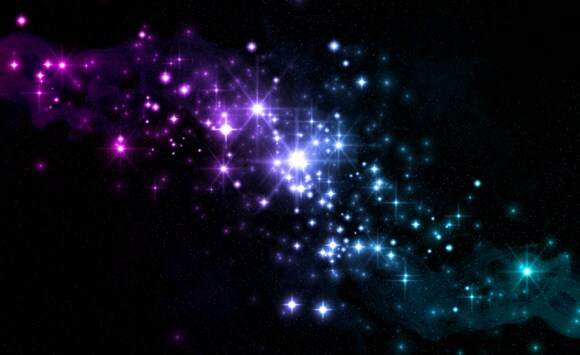 This tutorial will show you how to create a Galaxy inspired Photoshop effect. You can use this effect as text effects or you can use it as a background graphic. This effect will try to imitate what we see in space such as cluster of bright stars, streaks of light, colorful galaxies and clouds. Overall, this effect is somewhat geeky but still vibrant and fantasy filled. First, open up your browser and type the word “Smoke” in Google search. 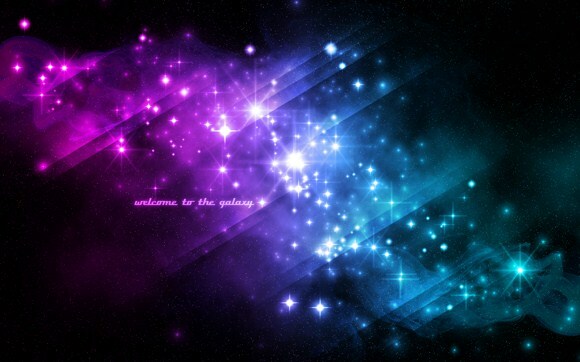 You will need this couple of free stock images as a resource in our galaxy effect project. You will also need this kind of Photoshop brushes at http://qbrushes.net/objects/star-brushe/. Be sure to save all these files in a folder where you can easily locate (example: desktop or my documents). Next, create a Photoshop document with rectangular dimensions. A 1600 by 1000 pixel Photoshop document resolution will do well. But if you want a rich output, you could choose a larger resolution. Choose black as the background color and insert the smoke image into the document. 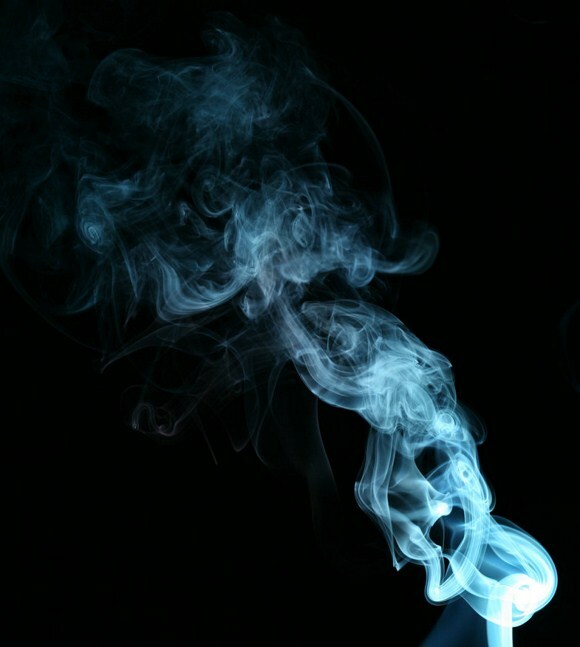 Place the smoke just like shown below. You can also duplicate the smoke layer to fill up the blank space. 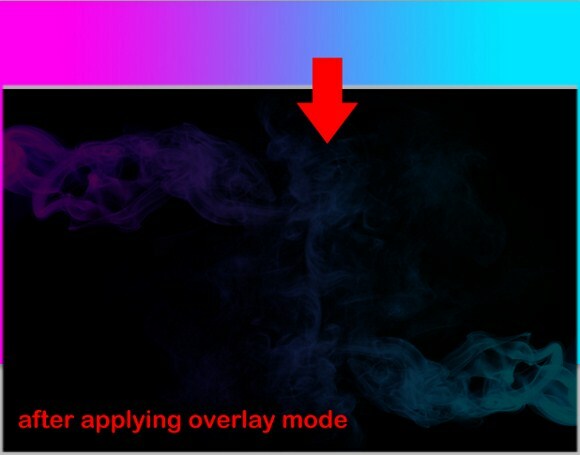 After placing the smoke, merge the layers (if you have more than 1 smoke layer). SET the layer BLEND MODE to SCREEN with 15 percent opacity. Create a new layer (create/place it below the smoke layer), and press key “D” to revert the color swatch to default black and white. Go to Filters > Render > Clouds. After that, create a new layer again and select the Gradient tool (right click brush tool to open the gradient). Choose bright colors such as cyan and magenta. You could also try more than 2 colors such as neon green, indigo, red and yellow. Okay, this next step will be quite frustrating because outcomes may greatly differ. First create a BLACK filled layer. 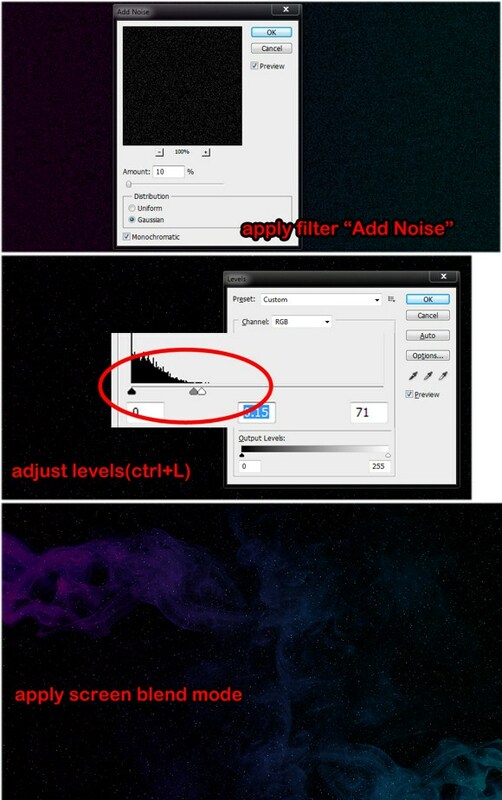 GO to Filters > Noise > Add Noise. Set the amount to about 9-11 percent as long as there will be not too many dots. After that, press CTRL+L to adjust level and set [0 - any amount less than 1 -70]. See the image below and try to follow that pattern. The dots stars will have differ in brightness as you adjust. You know when you have done it right when the output will look like a star field with stars seems to have different distances. Lastly set the layer to screen mode. Next, load your star brushes you have just downloaded. 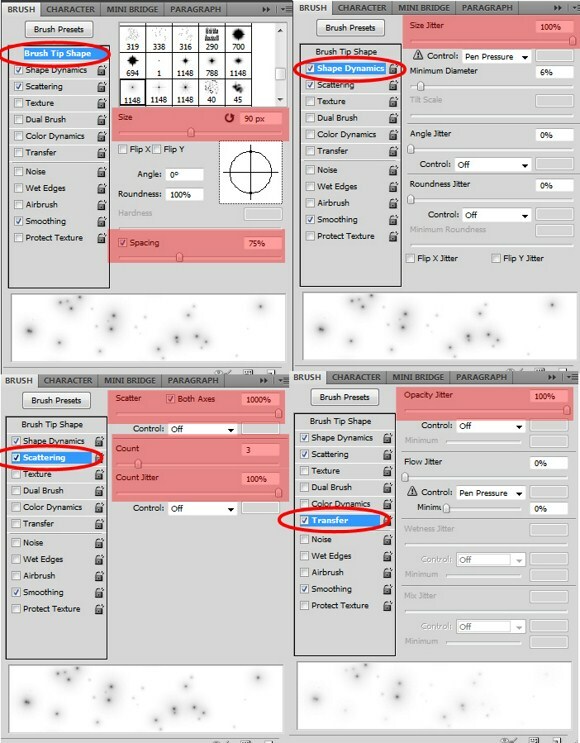 Select B or brush tool, and press f5 to find the brush tip, and then select any of the star brushes. On the brush tip shape, choose a decent size, not too large and not too small. Adjust the spacing to about 70 percent. Next, apply the shape dynamics and MAX OUT to 100% the Size Jitter. Apply Scattering then set the scatter to 1000%, Count to 3 and Count Jitter to 100%. 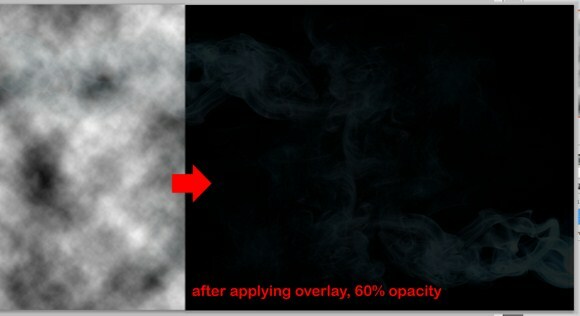 You could also apply Transfer (named differently in other PS versions) and set opacity jitter100 percent. You also need to apply the same settings to other star brush tips. Now with all the brush setting, paint creatively. 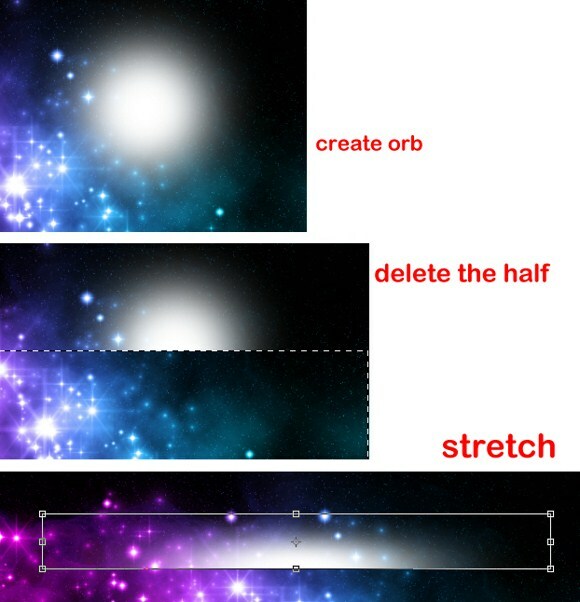 Make sure you made a separate layer for the stars. Create a new layer and name it "space clouds". Using an ordinary soft brush and white color and 20 percent BRUSH OPACITY, we paint over some parts. Lastly, here are the last few important steps. 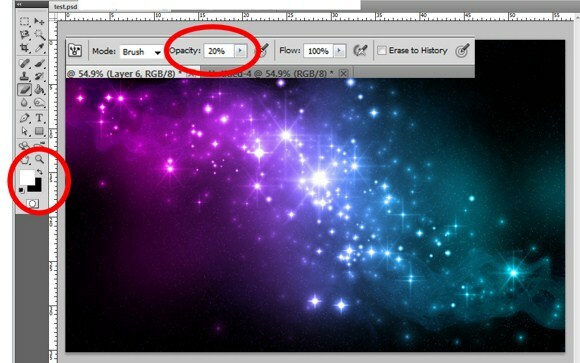 Duplicate the gradient layer and set the copy to 25 percent opacity. Then create a new layer above the”space clouds” layer, press “D”, apply Filter > Render > Clouds. Then Press ALT+CTRL+G (this will apply clipping mask) on the recently rendered cloud. Also take note of the arrangements of the layers. Create a new layer (again) and paint a large glowing orb. Press CTRL+T. Cut the half and then stretch it. Now set this object to overlay mode, rotate to the desired angle, and place all over the image. And finally you are done with the galaxy effect. hey, where are these "star brushes" you refer to. cit: "Next, load your star brushes you have just downloaded. Select B or brush tool, and press f5 to find the brush tip, and then select any of the star brushes." thanx. cool tut btw. This is a really cool effect! Thanks for teaching me how to achieve it.